I was invited by a local Tai Chi/Karate teacher who lives in Kobe, but is from France, who also studies Kyudo, to a French restaurant for dinner last night. It was not that far from our current home in Suita-shi. LZ got me directions and off I went. I took along my iPad just case. Reason being it has a GPS tracker. So I could mark where or at least close to where I wanted to go in advance and check if I was close by or way off. I made it to the exit station with no problem. After that things changed. Going by the map LZ made i was to go left when leaving the station. I did. I walked and walked, not feeling sure I checked the Pad. It was not on target bt i seemed to be in the general direction. I walked more. I looked at LZ’s map when I came to a large intersection. It seemed right so onward I went. I saw more marked that looked like they were what was on her map. I walked and walked. Feeling the Zen sense tingling. I checked the iPad. ehhhhhhhhhh! I was going the opposite way! Ok, I turned around. I walked back. I stopped in a local shop to show them the map. The guy was helpful. He came outside with me and turned the map the correct way and showed me i was on the wrong street.! I needed to go back to the station. I walked back to the train station to start over. I looked at the map and the station, it seemed I figured out what was wrong. The exit had two sets of steps. Use one and go left you are on a big street, which I did. Use the other and go left puts you on a small street. I asked a guy walking by. Yup he said and pointed down the small street. These small streets are more like what we would call in the states alleys. Not streets. Differently not a street a post office would be on, which was one of my landmarks. On I walked…again. Things matched up better on the map and what I was seeing. Still I was not sure. I stopped in a local shop and spoked with a woman there. She tried to help. She got out a local map and showed me where we were. I took out the iPad, she says. Soka, then turned it the correct direction and showed me where we were in relation to where I wanted to go. Not far away just down the block a ways then turn. I thanked her and left the shop. As I was putting the Pad away I by mistake lost my marker. So now I had no reference to where to go. Grrrrr, ok. Not panicking I walked in the direction I was shown. I understood I only had a short ways to go then turn. I walked a couple of blocked , then stopped. Hmmmm not I could make out from what I was told. Again I stopped in a shop and asked. The woman there I showed the Map LZ had made. She did not know the marker, but she knew the name of the restaurant. She went outside with me and point down the street at a building. Yokatta. It was nearby. After a couple of minutes walk I was there. Yatta! I met my acquaintance and his friend/student there. The meal was pleasant I had a mixed cheese salad and some cold pumpkin soup. The soup had a good flavor, after I got over the shock of it being cold not hot. We had pleasant chat about martial arts, Japan, Japanese, France, America. Etc. We share the same rank in Kyudo currently. He is testing again in Sept, I am planning Nov…ganbarimasho…Yosh! On the way by to the station, I stopped by a local shrine to look around. It was quite nice by evening light. I also stopped in a little recycled clothing shop on a side street. I ended up on the wrong street from what I thought after crossing a large street and not going back far enough. It was not a big deal I was headed in the right direction. After asking a local guy I got back to the main drag where I found the train station and hopped the train home. It was good mini adventure. I saw another part of Osaka with some interesting shops. Also got to speak with a few locals all of which were helpful. No one had an attitude and all were kind in dealing with me. I went back to Banpaku Kyudojo today. This was my last week in the area and I was looking to see Nogami Sensei before we left to our new digs ( home) . I wanted him to know I have been practicing also to get some feed back from him on my shooting and form. The last two times I have been there he has not. Today was cooler so I figured he would come by. I got the usual friendly greetings from everyone, perhaps a bit more so this time as they know me by now, I am a local. I was over in the markiwara area when I saw Sensei come down the street. I was the first to greet him when he entered. He smiled upon seeing me and said something I did not quite get, but I know it was good. Something like, it is good you are here to practice or something like that. I continued to stretch and practice on the makiwara. After a while I was called by one of the Renshi to join them and the others in front of Sensei shooting. I messed up a bit on the edict of the first shot. I knew one did the full Tai Hai at Senshinkan on the first shot, but I did not know here also, I thought so but was not sure. Now I do. Anyway Sensei had me at the first marker in front of him. I went through the steps, I thought I did fairly well. I missed my first shot by a little. On the second shot he told me to straighten my left more. Turn the elbow out instead of down. My shot would be better. I did, it hit center! He smiled and gave me the two thumbs up saying, San-dan, Sandan no problem! I had another small correction on my exit it was just a bit short. I was off to the side drilling the arm thing when I was called in next to Sensei. He had me put my hand on his belt at his stomach. Then we went through the 8 steps showing me where to breath especially in Kai and Hanare. I bowed and went to practice that. After a while I was again called by the group to join in. Full Tai Hai. I was asked did I want to be first, Omai? Ehhhhhhhhh?!! They laughed and said the middle is better? Hai ! I said and off we went. My second round was not as good. Sensei said something wile I was shooting, I did not quite get, but i think it was correct your arm. My first shot was bad. The second, I corrected sooner and did the breathing, I was in line with the center but just a bit low on the aim. Still not bad I thought. Oh,yeah that is when I got the correction on coming forward more before turning. The first time I was already in front position. Not having practiced anything the last week and half I was running out of steam. My legs where getting weak. Such is the importance of keeping up my Tai Chi and Fu practice daily, keeps my leg power up. It has been too hot by the time I have been getting up, also the mosqutoes have been a great turn off. I got some new oils in this week to mix up a batch of repellent. The peppermint oil alone has not been working that well. Now I have oils of Catnip, peppermint, lavender, and citronella. I will make up my own blend. I may smell kind of weird, but if I do not get bit, it is ok. I can wash afterwards. Anyway, my legs were getting weak toward the end. The group took a break I continued to practice and stretch my hip joints. I need to start back with my yoga in the a.m. on a regular schedule. There is more to Kyudo than just shooting, as there s more to Kung Fu than fighting. Sensei sent someone to fetch me to the break room for tea. I was given something that was red like Hibiscus, but tasted like apple cidar vinegar. It was iced. If I not used to drinking Apple Cidar vinegar it would have been weird. Well it was still weird but in a good way. Along with that we had some chocolates. This is the difference between Banpaku and Senshinkan, the group. I have not been with all the groups there as they have many different times for meeting. Still I doubt if they have this type of gathering, it is a different kind of feel there. I decided on the way home, even after we move I will come back from time to time work practice with this group and Nogami Sensei. It will be a bit costly so it will not be often. Hopefully the Universe will provide me with some work income, then at least I can visit every couple of months. I certainly want to come again once before I test in Nov…Yosh! This is the final segment of a project I started quite a while back. I am just now finishing it, for several reasons. One, I got busy with the Pacific Eco Passage. Two there was not much, well any feedback on the part 1 and 2 from the blog, so I figured no one cared. However now that the Passage is finished and I have some free time of sorts and I do not like to leave things undone, I am putting the wraps on this section. The theme of this for those who do not know is about “Kung Fu” / Marital art and its purpose, it’s philosophy beyond that of just fighting. The three people I interviewed I studied with in some form or another. Two are classmates from Northern Shaolin Tai Chi Praying Mantis. The other is studying Northern Shaolin from the same lineage now. He is also my Kyudo guide, mentor of sorts one could say. not my official Sensei but I have great respect for him and his skills and style. I have the best connection of understanding of Kyudo and it’s nature from him out of all the excellent teachers I have encountered. The three interviewers also chose to follow through with their Martial Studies into gaining more spiritual insight of their arts through the practice and study of Zen. Each from a different path, Korean, Chinese, and Japanese. They also selected to refine their Martial skill with a different Speciality. Wing Chun, Shaolin Mantis, and Tai Chi/Kyudo. This final interview is the longest. This is due to I did not have to rush off somewhere for another appointment or to travel several hundred miles to return somewhere. I also tended to speak more in this one, due to the relaxed nature of the interview and my comfort with doing this now, after doing two already. There are a few parts in the interview that deal with something that is showed, but I did not think to take pictures so you will have only a vague idea if any of what is being spoke of…sorry. I could have edited out those parts, but I do not have that kind of time to burn right now. Maybe later I will, if there is a big outcry :-). So again Sorry…deal with it. 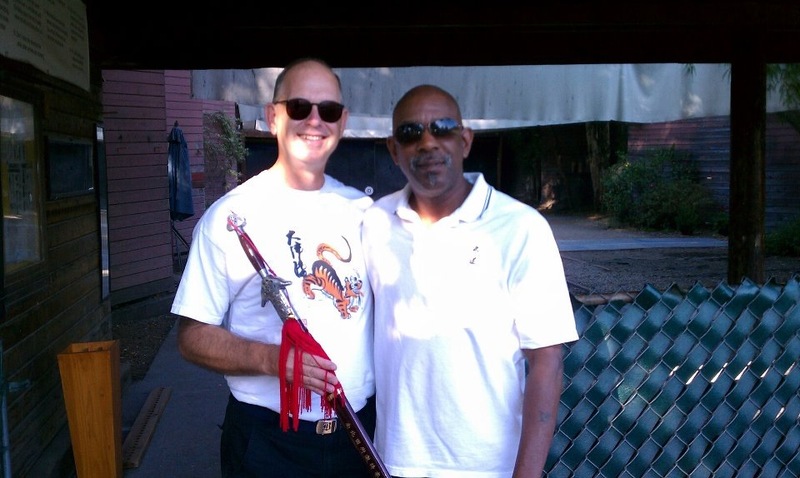 Perhaps this interview will have more interest as my blog readers tend to be more from the Kyudo path these days, and Rick Beal aka Rev Sensei Jyozen is a Kyudo Master, with schools in CA, Hawaii, New York ( maybe some other places I do not recall). In the past I had practiced with a small group in the park near to Okasan’s. Since being back I have not been but once, figuring I get more from my own practice. 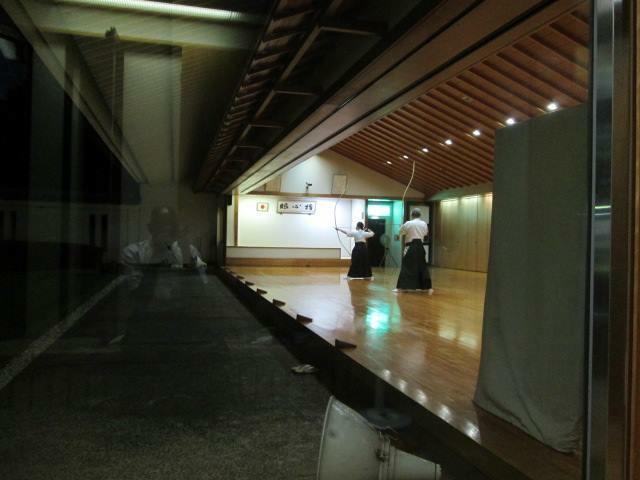 I did not know there was another Tai chi group around until I went to Senshinkan for Kyudo. I saw on their class schedule there is a Tai Chi class on Fri mornings. I went his last week to watch. I wanted to see what they are teaching and the structure to judge that against what I had planned. Last week was a Japanese holiday, Obon. So there was not class. This week it was back on track. I got up and after a light breakfast walked over to the Budo center. I really love that it is close enough for me to walk over in about 20 min. It is a good way to get in a little exercise and save some money. I was thinking on the way over, since getting my first car when I was in my late teens, a 1956 Pontiac, I have never been without one, except for when I first moved to Hollywood back in 1970. Even then after a week or so I purchased a motorcycle. Here I have no plans any time soon to buy a car…I would love a motorcycle again though. LZ does not like that idea and wants a car, later. I want both and another boat. Life is short and getting shorter. Right now though I would love some livable income. Anyway, one thing at a time, and when it is time it will be. I walked to Shisenkan, it was a bit cooler today than yesterday so it was a fairly comfortable walk. They did a few Chi Gong drills I had not seen, then some stretching. Meanwhile in another part of the room a man, I found out later and figured out on my own at the time, was the Sensei. He was working with a couple of people. Showing them a technique and having them drill it. I was already impressed it was not just a tai chi “dance” class. After warm ups and a short break the class split into three sections. Very new beginners, beginners and intermediate. The Sensei had the intermediate/advance people. He had them do a small amount of moves over and over, and lectured them, and drilled them, lecturing. It was good! The other groups also drilled and drilled. I was not part of the class and was just on the outside looking in, but from what I could see the class was not about just learning a bunch of moves and finishing the form. It was about understanding them, the weight transfer, the expanding and contracting of the body, balance, the application. It was a good class, it was also a large class. It made me feel there is a place for that kind of class, that kind of teaching. My program would work well. Near the end a guy came over and spoke with me some. He started in Japanese, then switched to English. It took me a moment to realized he did that, then spoke slowly. He said he was a Tai Chi beginner, Only a couple of months. The class was challenging. Was I interested in joining the class? New students were taken every three months. I thanked him and said I am a teacher, and just watching. Also for him to ganbarimasu. He asked if I was going to starting teaching there. I explained I am just passing through and study Kyudo here until we finish relocating next month. I will be looking to teach after that in our new area. It was a worthwhile visit. I feel better about looking to setup a class here. I need to find a location once we relocate. From what I saw today it could do well, even with my limited Japanese and also set as a English conversation/practice class. Also LZ can attend class and translate. I was told by Senpai K. That one of the Kyudojo’s has dance classes at the location when there is no Kyudo happening. This maybe a good place to setup a Tai Chi class on an off time. I am a couple of weeks away from a visit…Yosh! Banpaku is the first Kyudojo I visited in Japan. It is where I met Nogami Sensei. It take a bit of effort to get there, and it is not as modern as the Dojo within walking distance, Shisenkan. I feel more like it is home base for me. Perhaps because it is where I got my real taste of Japanese Kyudo. Perhaps because of the people, most everyone greets each other when they come in. I went there today for my practice. Nogami Sensei usually shows comes in on Tuesday, today he did not, too hot. Heat kills here in Japan. I heard there have been more heat deaths this month than the whole summer last year. At 90 yrs old it is best for him to stay in a cool place. I know my Sempai, K. was disappointed . He came in today to see Sensei. He is testing this weekend for Renshi and has been hoping to get some correction/guidance from Nogame Sensei. Sempai K, was sent to train with Nogame Sensei by his Sensei at the other Dojo. That says a lot about Nogame Sensei! I thought he is a Hanshi Dan, today I found out for sure he is. Today I again planned on working mostly Makiwara. I did for about 30 min. Then I took a break. Just before that I was shown a different way to hold tenouchi on my right hand, by a couple of Sempai when I asked about cleaning my glove. This new way was also repeated by one of the Sensei there today.. I had been placing my thumb in the joint of the middle finger. I was shown to place the middle finger just on top of the thumb. That helped with the sticking issue and gave me a smoother release.. I was concerned about where to place the ya, but that turned out to be a non-issue once I got the fingers correct. I still have to be careful not to twist the ya. That is something that throws my shot off. I think that is what happened the other day at Shisenkan dojo along with the sticking. Speaking of shots. I was requested to join Semapi K. In a line up to shoot, tournament timing tai hai. Thinking I can not say no, and it is just practice so off I went. However it turns out it was the viewing of the day by the Sensei’s who had arrived. I felt the testing pressure, sort of, but blew it off…mostly. I was not as nervous as the other day. Still I was not feeling 100 % with the new tenouchi. My tai hai I feel comfortable with so that was not an issue. Still I have not done it with a group since leaving CA. My only mistake was cutting off too soon leaving the floor, I was called back for that, but everyone was smiling so it was not a big deal. My shots…the first was just a bit off, but the second was center! Yatta. I am improving my sighting. The rest of the day’s shots where not as good, but that is ok. I know I am capable of doing it. Also my form feels better. As I get more tired my shots go off, that is natural, more so after such a long break as I have had. Today I did not go until exhausted, but I could tell my quality dropped as the day went on. One thing about the Banpaku Kyudojo is nice is the breaks. It reminds me of the Nankai Kyudo club in LA. They take a tea break together. As does Banpaku, I did not see that at the other Dojo. This is perhaps one of the qualities of homeyness that Banpaku Kyudojo has over Shisenkan Kyudojo . We will be moving to our new part of town and home on Sept 1st. So I will only have a few more days of shooting left here. I will cut down to once a week at both Dojos, to conserve money. The fees are very reasonable, however since I will not be testing until Nov and starting a new Dojo next month I will conserve on our limited funds. Even though small it is an outlay. We really need an input source for some funds to really settle in comfortably. The job market is really limited here for a foreigner and the hoped for work in the yacht field turned into just so much air. As did the music, and doing minister at weddings thing. I have signed up with a couple of modeling agencies, who knows maybe even a little work from there will happen. I am not in bad shape for an old dude, I hear they need all ages and types. The work focus now will be my setting up some Tai Chi classes and some on-line work. Also finding a few students who want English convo classes. I have been contacted by one guy already, if he follows through on his interest that will be a small start. There is the outside chance that a friend who is a CEO /President/ something head of a couple of businesses can get me some misc work or has a connection. Currently he is still out sailing, but is heading back soon. His girlfriend has a band, so maybe even something might come of that, we are supposed to Jam together once he is back in town.…yosh! I found out that there are evening practice times at Senshinkan, I was up for that. Evening are cooler plus you have the darkness, light factor thing going on. I figured to practice some Fu then Kyudo. The walk over would be nice because of the cooler temps and the walk back better.. I modified my plans once I arrived and went right to the Kyudojo. I wanted to see what the procedures were when starting. Upon entering I was greeting with many Konbanwas from many, not all many. Some people are shy or just not friendly. The. night group seemed nicer than the day timers, No matter. There was a group of people practicing for a tournament and a Sharei so access was somewhat limited as far as the full use of the Dojo. Not a problem. My new friend from the other dojo was there with his wife the Ryokudan or Kokyudan I forget which. Anyway he was a big help to me. I mostly watched in the beginning to learn the right edict. I told him I was learning the right way to leave and enter as the Dojo was set different. He showed me, and explaining things. basically change from left foot to right foot entering , then left foot leaving. It was weird getting use to that. I spent some time just drilling that. I spent some time just working on the Markiwara again, because I was still not comfortable , or pleased with my release. I noticed that many people kept inviting me to shoot the full range. To me doing the Makiwara is like working on basic in Kung Fu. The better they are the better the rest will be. Eg: The stronger the roots, the strong the tree or prettier the flower. The Sensei came over to me at one point. He mentioned about my glove and bow still being in Cal and I will be pleased when I get it…. Something like that. He also said that Markiwara time was important…or something like that. He added that i needed to expand my draw more coming out of Daisan, it was too shallow. It was unexpected help and I thanked hm. I think he was impressed I was not in a rush to go after the tragets and wanted to be correct with my basics. I noticed from the couple of people that spoke to me that night and at the other Dojo, the basic questions are. How long have you practiced, where, and how old are you. For some reason the how old are you is a big question. Something we never ask in the States for the most part. Anyway I spent the night on the Makiwara and watching. This was fine with me I was not in a rush to shoot. I did not want to be embarassed by my arrow flying into another mato across a lane. The more I work out these flaws now, alignment, crosses, release, Tenouchi, the better my hits will be. I am determined to pass the San-Dan test then to Yondan, next year. I even dreamed about shooting last night. Perhaps the failure of the first San-san attempt and the failure to reach here by boat has placed more importance in my physic on passing SanDan. I went back to Senshinkan Kyudojo today. I decide I wanted to have access to the Dojo since it was nearby. I was told yesterday I did not need an appointment but to come around a certain time. Then I could do a Makiwara test. Ok cool can not be that hard. Yosh! He leaves, I follow shortly after to the Dojo. A few more things I am told. I get most and get settled in. I needed to test in front of him on the Makiwara. He had me warmup first. Afterward we went to a small office he told me some rules and misc stuff about the club and asked me some questions. As it turns out because I am a local get a better rate to come in and practice , very cool! Not only do I save the train fare by walking, I save on the admission. I am pleased. Shiaouwase! Next up the test. Simple really, he says watch him first then my turn. He does the basics, then I follow. He asks me to repeat it again I do so and he is pleased. I get the ok to practice with the group. First I need to do some paperwork and entrance stuff. We go back to the office he get paperwork and shows and tells me what to do. It was a little challenging to figure things out, but it got it done and I was in! Yatta! An added plus to this besides the reduced fee was that I got the ok to spend a portion of my visit time on Kyudo and another part just practicing my Fu or Tai Chi. Very cool. An even floor, with no ants to step on, and no bugs to bite me! Plus I can take a shower afterwards. Yeah, how cool is that! So on to the 28 meters. I was cleared to shoot now so I wanted to work on my aim today. My first shot hit the target! However it was the target in the next lane! Whaaaaaa! How did that happen? But it was the right height. My next shot was just off of hitting the correct target, just a little off , enough to make noise on the edge. Ok I thought I am getting there. My next shot was totally weird. It went almost two anes over. what the heck! It felt like the arrow and my glove were stuck together. Really weird feeling. Also I could feel a decrease in strength it was time to stop. I checked over the glove and the fit of the nock on the string. Everything seemed with in reason …mostly. With things externally reasonable. I followed the Zen path … I looked at myself for the problem. Perhaps I was holding the string and the glove all to tight on the draw. I needed to use the glove more and less of my hand power. Perhaps this was also why it got so cramped yesterday. I did a couple more makiwara shots just to test the theory. I recall a Sensei telling me in the beginning days the thumb should be up against the top of the thumb slot, not pressing down on the finger. It worked fairly well. Rest, relax the hand more, let the glove do it’s job. Tomorrow I will give it the 28 meter test…yosh! My last time visiting Nogami Sensei he said there was another dojo nearby, within walking distance. I was curious. I had LZ look it up. Yes it is in walking range. So on last Sunday I took a walk over there. It was a fairly pleasant walk it took about 25-30 . I was not quite sure where it was, so when I saw a few kids I asked where was the Dojo? I first they looked at me like I was from the moon. Then pointed to the gateway they were standing in front of and said in here. Thanks I said smiled and bowed. The place was not I expected. It was large, and old styled. I went in and to the office and asked if I could just see the Kyudo Dojo. I was expecting just an ok and a point, since i had heard they were not that friendly there. A lady said ok and came around out of the office and had me follow her. She then took me on a tour of the building. It was a full Budo center. Judo, Kendo, Karate and Kyudo. She took me to each room, then said I could hang out and look around on my own and left. I was impressed. I had a drink from the vending machine and sat in the lounge chilling in the a/c for a bit, before heading back upstairs to the office. There I asked for a phone number. I figured since the next day was my birthday I would come here and shoot for a while to practice on my own before going over to Sensei’s Dojo on Tues. that was the plan. LZ called on Monday and was told I could not just come in. I had to be checked out by a sensei in front of a Makiwara then registered before I could come in on my own. None of which could be done until Weds and I needed to make an appointment. So much for that plan. Plan B , which could still be classed as a birthday plan was to go on Tues to Sensei’s Dojo. Tues here is Monday in the States which was my birthday. Ok, I could still get in a birthday practice . However now I would have most of the day to practice instead of just 3 hours at the new Dojo. I figured I could go in early and get some solo time in with the new Yumi before Sensei showed up. The flaw on this plan I was told was it is Obon and the Dojo may not be open. LZ called Monday , she called late and got no answer :-(. She called again on Tues morning the line was busy she said, she tried several times. I figured if it was busy someone was there. So I made ready to go. She said what if it is closed, my reply, then I will know how to get there on my own, without you. So off I went. I walked, I read signs, I got the monorail , read more signs, changed trains and made it to the Dojo. from the street through the fence I could see people shooting! It was worth the trip. I went for the first part of the challenge. How to sign in. No one was at the office, which seemed to be normal for this place. I looked at the papers , and saw what I thought was a sample form to fill out. Hmmm. Ok. There was a guy doing some string work on his Yumi. So I asked him, to confirm my thought. He did and helped me a bit. Bam I was “In Like Flint.” ( some may or may not know this reference, no matter). I changed went out and got settled. I went over to the Makiwara section to get some practice in my loaner Yumi. Whoa, it was stronger than I thought besides being large. However I was able to handle it. It made me really shot with my Bones and Tan Tien. I also notice my tenouchi was better and therefore the spin with the larger bow. I shot, I took a break , then shot more, then another break. I wandered over to the 28 meter section to watch. There was a Sensei making some adjustments to a few of the shooters. I made note of what he was telling them. Not so much the words which I could not get, but were he did adjustments while they shot. I was invited several time to join in a shoot by several shooters. However I did not feel ready. I could work the Yumi but I was not comfortable yet with shooting or joining in the group. So more Makiwara then lunch. After I had some lunch and a couple more shots at the Makiwara I decided to go for it and join the group. I was nervous, I could see the overseeing Sensei watching…closely. My first shots were low and hit the ground just in front of the target. If higher though would have been centered. The first two shots were done I walked off . I grabbed another two arrows and went back. Still fairly nervous with the eyes on the Sensei on me. I was focused on my movements. So much that I did not notice the red flag out until I was about to raise the bow.. Then I notice the flag and paused at that same time another shooter, an another Sensei came up and said I am supposed to stop when the flag is out, and gently had me unready myself. This is the lady who also teaches Tai Chi. I like her. I watched her shoot earlier. She is smooth. Not as strong as the queen, but very smooth. I will get her name and ask a few questions next time. I was too nervous about the newness of it all today and she had already corrected two of my “dohs” today. One about removing my neck chain, the other stopping with the red flag. Oh well. I’m new and a Gaijing, I get some slack by default at least in the beginning. There are some advantages to being a round eyed foreigner . Ok, so after the red flag incident and having another upper rank give me a gentle lecture, while I was removing my glove. I figured I should be more alert. This woman then went out to watch for a break to get the arrows from the targets. I watched just as I was stepping into slippers to go help, she waved me over. There I was shown the right way to retrieve the arrows and the way to group them and carry. Exactly what I was about to go see when she called me over. So another couple of rounds of me shooting without incident and I took a short break. After the break I was going for one more round as it now was getting on in the day. The first two shots still were off. I had not gotten my aim down with the Yumi, I was still a little low. The second group first arrow shot was weak. I felt my power going fast from the exertion of the the bow draw. On the second arrow my draw collapsed before I could shoot. I tried again , this time forcing myself I barely got the shot off, the aim was high enough but off to the right. it was time to stop. I gathered my stuff to make ready to leave. I went into the rest area and meditated a bit to recover my strength, cool down form the heat and build up chi. After finishing putting my equipment together , I went into change. There I got into a conversation with a couple of the guys also changing. One spoke a little English, the other did not, but between my poor Japanese and the other guys English we had a fair conversation. Mostly about, where I was from, where did I live now, where we are moving to, and why I got involved with Kyudo. Normal questions one would wonder from a stranger. One of the guys i found out after he gave me his card. The English speaker is test in a couple of weeks for Renshi. He is a Godan, his wife is a Renshi. He wants to test but he feels his shooting is not there yet. The only bad side to the day was on the way home after leaving my right hand did a major cramp up. Itai!, sugoi ittai! LZ being in charge of all things Japan related has been in charge of finding us a home base. Since I have no clue about any of that it falls on her shoulders. There was a place she located when we first arrived that was till listed weeks later or however long it had been since she saw it. It is an older place but refurbished. No parking, which is not a problem for us since we have no car, nor plan on getting one anytime soon. Also this house is out a ways from the city, not quite farm land but considered “country ” by ya’ll city folks. We liked it. One really gets a feel for older Japan in the hood. Rather than being in the city where all things look fairly alike. She made arrangements for us to look at three places on one day . The last or next to last being the one she wanted. It was a two-hour train ride to the countryside outskirts. There we met up with the first realtor . He tool us to a pretty common small apt complex. I was not impressed and when LZ saw a roach that did it for her. It would not have been a good place. Not private and kids right next door. The good thing was it was very near to shopping and the like a matter of blocks. This completed the showing for this realtor. He dropped us off at the mall, the impressive mall. It had everything! Shocking! It had many eateries. One of which is called Natural Kitchen. They had a deal where you purchase a main dish and get all these side dishes as much as you can eat…free! It was good. I was able to fill up! Salad, tofu, other veggies, OMG it was heaven after being moderate on a budget. We both filled up and planned for no dinner or something very light at the most! Afterward we walked about 20 min or so to the house LZ wanted. It was through an older neighborhood. One really got the sense of being in Japan. Small streets, close houses. LZ said before she went to the states she would have not like it, but now it felt good and she like it. . I liked it right off. We walked and wandered and finally found where we were suppose to go. A small house on a dead-end street. It has a small front yard and two balconies. Front and back of the house. It was just what LZ wanted, I also liked it. I would have liked a bigger yard but this one will do. On top of everything the price was right. The Realtor took us to one other place that was larger, still no parking and also refurbished, but it did not have a yard or storage, not the character of the house. It was a one level apt not a two-story house, which was nice, but it was also on a busy street. Overall the negative outweighed the positive and we put a deposit on the old small house. We have not been near the water or a marina since the tragedy. One of our limited friends here, really our only friends as a couple invited us to dinner when we came to visit. We went to Tajiri Marina were Aoki Yachts corp. is located. This was supposed to be our final stop after the Pacific crossing. We finally made although not as planned. Life is like that. We took the train ride over to the marina from Suita-shi. It was a couple of hours ride out to the countryside. It is not something we can afford to do much, so it was a painful splurge at $40.00 round trip for the two of us. It would have been 60.00 had we gone another route! Anyway, it was good to get out and visit. We stopped by the marina office for a while and shared the tale of adventure and woe on the high sea. LZ did the talking in Japanese so it could be understood. Yoh Sensei agreed calling for help with a broken rudder and high sea was not uncalled for and a valid reason. Afterward we went to an Izakaya on site. We were treated to a good dinner, drinks and shared laughs. We also got the local knowledge of the area which was big help. We made arrangements to meet again in the near future and visit their home. 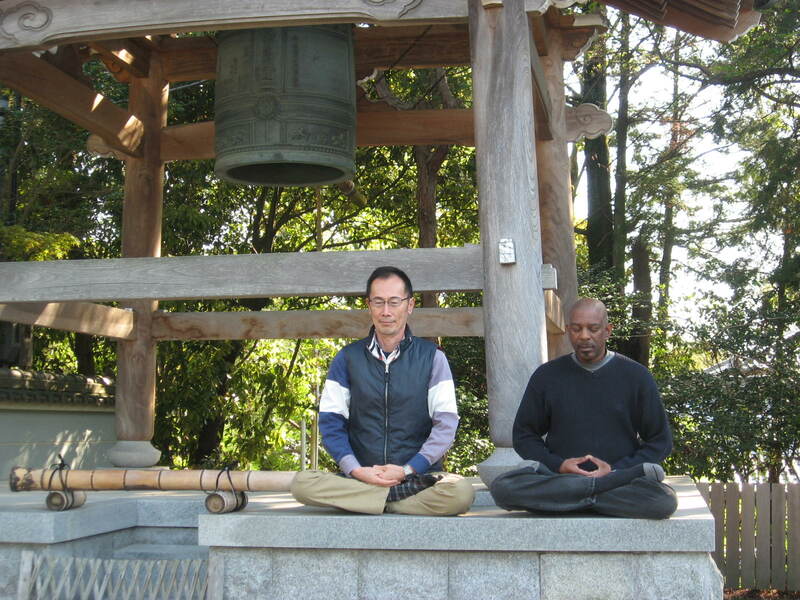 I was also invited to visit the Zen temple where Sensei lectures and meditates, whenever I am free. Being free is not the issue right now, but affording the train ride is an issue. I am hopeful that can change in the near future. Currently lack of livable income is the big Yin of the present. The Laws of the universe say Yin must turn to Yang as all life is change. I await the New day.